Join us for the University Singers' Spring Concert Friday, April 5 at 8:00pm in Old Cabell Hall. Tickets are available at the UVA Arts Box Office in the Culbreth building, online at http://tickets.artsboxoffice.virginia.edu or by calling (434) 924-3376. “Live for the moment” is advice that is frequently offered to those who get caught up in life’s day-to-day details. While sound, this philosophy seems short-sighted, particularly to those who fondly recall the events of the past or even those yearning for what is yet to come. The University Singers presents a program of choral works that, when stitched together, help to illustrate the arc of a lifetime through music. Whether it’s the chase that thrills or the balm that soothes, there is a universal message to be received. Yet these seemingly common experiences, when colored by someone else’s story, become anything but common, speaking to heart, mind, and soul. Included on the program are works by: Dale Adelmann, Johannes Brahms, Giacomo Carissimi, Rollo Dilworth, Eric Whitacre, and more. 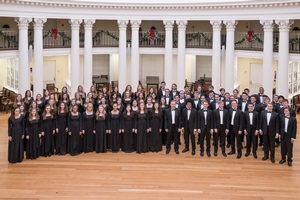 Led this term by visiting conductor Ryan Mullaney, and in collaboration with Deke Polifka at the piano, the University Singers is the University of Virginia’s flagship choral ensemble, performing a cappella and accompanied choral literature including major works with orchestra. This season, the group joined the Charlottesville Symphony on the steps of the Rotunda to perform for UVA’s Bicentennial Launch Celebration, before an estimated crowd of 20,000. In recent years, the Singers have also sung for Les Misérables creators Claude-Michel Schönberg and Alain Boublil during their UVA residencies, sung for the 2016 UVA Holiday greeting which received more than 400,000 views on social media, and taken a two-week concert tour of England, the Czech Republic, Poland, and Austria. Founded in 1957, the group became a primarily student ensemble soon after UVA began admitting women in 1970, and celebrated their 50th anniversary with the 2007-2008 season. Recent repertoire has included Beethoven’s Symphony no. 9 with the Charlottesville Symphony, Bach's Mass in B minor, Handel’s Messiah, Bernstein’s Chichester Psalms, Verdi’s Requiem, and Mendelssohn's Elijah, as well as premieres of works by J. Todd Frazier, Stephen Paulus, Forrest Pierce, Judith Shatin, and Eric Whitacre. Recent United States tours have taken the group to Atlanta, Boston, Buffalo, Charlotte, Charleston, Chicago, Cincinnati, New Orleans, New York City, Philadelphia, Providence, Virginia Beach, and the National Cathedral in Washington D.C., as well as the campuses of other American universities for collaborative concerts. This weekend, we honor the service of Professor, former Music Chairperson, and distinguished composer Judith Shatin. We dedicate tonight’s performance of her work Adonai Ro’i to her many years of service to the McIntire Department of Music at the University of Virginia. Please call the Music Department at 434.924.3052 for more information. Tickets are available at the UVA Arts Box Office in the Culbreth building, online at http://tickets.artsboxoffice.virginia.edu or by calling (434) 924-3376.